Mixed report today, from all three halls. Retail chains still seem keen to get stock gone, while the fleets aren’t giving anything much away. There seemed to be stronger buying today as anyone with a sales site reckons he’ll only have to finance cars for six weeks before the January bounce, so better to buy now than wait until then. That said there are now so many cars on the Blackbushe site that you now have to reckon on 20 minutes to park up in the Sunday Market area and walk back to the halls. Some picks of the day included a 31k mile 05 Fiesta 1.6 Style auto: a basic car, but a proper 4-speed auto. That sold for £3,900 and will make an easy £5,750 retail. Current shape CLK convertibles are now readily selling at under £20k, with a 27k mile 2004/54 200K gone for £18,800. A 48k mile 2001/51 Peugeot 206 CC 1.6 S was just £4,650. Someone got away with a 116k mile 03 reg Megane 1.5DCI, realising its £35pa tax status overcame the mileage blight. But a 121k mile 06/55 Corsa 1.3CDTI Design, also £35pa tax, was better value at £2,050. If you have a hamburger stand or kebab stall that need tugging around, a 94M Discovery V8 and a 99V Ford Explorer were both cheap at £800 and £1,050 respectively. At the other end of the scale, the crowd went mad for a bottle green 97R Polo 1.4CL 5-door auto with just 17,000 miles and history to prove it. That car made a massive £1,700. A slightly scratched ex-Motability 2004/54 facelift Jazz 1.4SE CVT-7 with 19k miles sold for a strong £6,775. 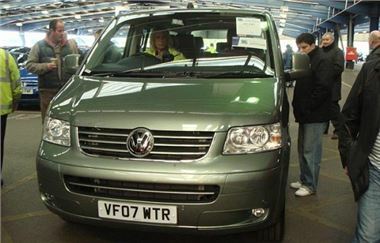 And an 07 VW Caravelle certainly didn’t get left out in the cold. It had everything: 174PS TDI engine, Tiptronic box, leather, satnav and just 5k miles, and went for a solid £24,800. Just in time for the party season. I’d guess by January it will have done 25k, making some of its money back ferrying people to and from restaurant, pubs, clubs and airports. Here’s the list. As usual, ‘s’ means sold. ‘p’ means top provisional bid, ‘n/s’ means not sold. ‘n/w’ means miles not warranted. ‘MNW’ means unknown mileage. ‘dmgd’ means damaged. Fleet Direct, Lex, Bank of Scotland, Inchcape Prestige, Porsche p/x, Mercedes Benz Retail p/x, TOP CAR, Franchised Dealer p/x, Inchcape no reserve p/x, Hartwells p/x, Pendragon p/x. Tuesday 27th November 12.00 midday start (viewing from 10.00am). Leaseplan Live Online, Black Horse, Lex, Bank of Scotland, Prime Fleet, Jardine p/x, Inchcape p/x, Sytner p/x, Snows Group p/x, Trident Honda p/x. Light Commercials from Dagenham Motors, Lex, Fleet Direct, Peugeot, XBG, Citroen, Northgate, Leaseplan. Fleet & Finance, LTSB Autolease, Motability, Lex, Vauxhall Leasing, Masterlease, Hitachi Capital, General Section, Inchcape p/x, Charters p/x, Private Sure Sell.